Property 9: Bucks Cozy Cabin Adventure! Property 12: Secluded Mtn Cabin w/Deck - Walk to Lake Harmony! Property 15: Albrightsville Cabin w/Hot Tub - 10 Min to Slopes! Property 27: Cozy Pocono Getaway Close to Jack Frost and Big Boulder! Property 32: 8 BEDROOMS!! Firepit! Hot tub! Ping Pong and more!! Property 33: Historic Kempton Schoolhouse at the base of the Appalachian trail. 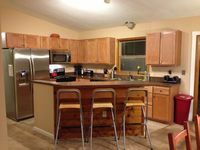 Property 50: The Brookside Lodges Pocono's Best Kept Secret!